The above info came from Lacey, and was edited by yours truly (contact me). The image came from Aleph. Neko no Ongaeshi is about cats, like the title suggests. The main character is a teenage schoolgirl named Haru, who rescues a cat from being killed. After saving him, he stands up on his rear legs and thanks her for it. She then finds out he is the prince of the Kingdom of Cats, a place inhabited by cats. 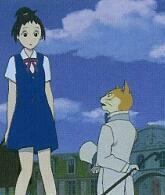 Haru is then taken to the kingdom, where she is offered the prince's hand in marriage, due to the king's deep gratitude. The animation is like the other Ghibli films, so if you liked them for the animation then you might like this one too. 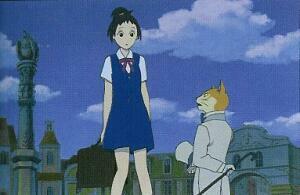 Also, Baron the Baron Cat and Muta from "Whisper of the Heart" are in this film. The above description came from Lacey, and was edited by yours truly (contact me). After Haru, a classic clumsy high school girl, saves a cat that can walk and talk from a truck, his father the King of cats wants her to become his daughter-in-law and sends his subjects to bring her to the cat kingdom where she becomes half-cat! It is now up to the charming Baron to help her get home and away from the naughty King. The above description came from Joey Guidish, and was edited by yours truly (contact me).